Do you ever wonder how some people just seem to rock at getting things accomplished, while others seem to dream big but never really get anywhere? It's not luck and it's no accident. Successful entrepreneurs know the secret to setting goals and making their dreams come true - they know about SMART goal setting. Goals that are specific address the what, why, and how of the goal. An example might look something like this: "Increase our Facebook followers to reach more clients by implementing a Facebook advertising campaign." Breaking that down further, the "what" of this goal is increasing your Facebook followers. The "why" is to reach more clients. The "how" is by implementing a Facebook advertising campaign. Goals should be measurable so that you can have real evidence of whether you've accomplished your goal. To build on our prior goal, we could add the following: "Increase our Facebook followers by 50% to reach more clients by implementing a Facebook advertising campaign." This way we know where we started and where we want to go, and can also gauge our progress based on interim numbers. We've all made goals in our lives that have been clearly unachievable, like losing 50 pounds in 10 days. There's just no way that's going to happen without us hacking off a leg, right? On the other hand, we don't want to limit ourselves. So, it's best to find a balance as to what will stretch your company a bit while still being achievable so you don't give up. You want to keep yourself and your employees and partners motivated. In setting goals, we want the focus to be realistic or results-focused goals. That means focusing on the results of our efforts, not necessarily the activities we undertake to get there. "Increase our Facebook followers by 50% in 6 months to reach more clients by implementing a Facebook advertising campaign." You've now put an achievable deadline for this goal of 6 months, which seems reasonable given the time it took you to get the first 5,000 followers and the fact that you've got some traction now to build on. 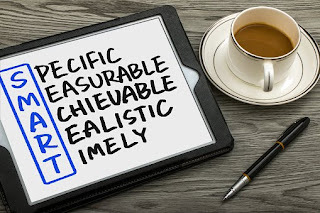 Try this technique with the rest of your goals, no matter how small they may be, and you can start tracking and achieving your business goals like a pro.